The Learn to Swim courses are to teach children and young teens to be safe in, on, and around the water and to swim well. Aquatic and personal water safety skills are taught in a logical progression through six levels. As they progress through the levels, participants build on their basic skills and learn to refine various propulsive movements on the front, back, and side. This is a free program that is used to gauge the level of the swimmer so that they can more accurately be placed in the correct Learn to Swim Program. The purpose of this class is not to teach skills but rather assess them. Varies by location. Courses typically meet for 30 minutes over 6 sessions. MondayWednesday, July 1–3, 4th of July week. Registration for swim lessons will close 3 days before the first session. The Minimum enrollment for any group lesson is 3 students. Classes not meeting the minimum will either be canceled or combined 2 days prior to the first scheduled lesson. If the class is canceled, a full refund will be issued. The maximum enrollment for each lesson is 10 students. There will be no make-up lessons beyond the scheduled lessons and no refunds will be given. Any photographs taken by Learn to Swim Staff becomes property of Miami University Recreational Sports Center. These photos may be used in future promotional material. Children ages 3–5 years old learn water safety, survival skills and foundational swimming concepts in a safe and fun environment. Skills are age-appropriate, allowing students to achieve success on a regular basis. Monday/Wednesday, July 1–3 4th of July week. Builds on Level 1 and introduces fundamental skills, such as kicking and builds on Level 1. Our six-level Learn-to-Swim program is unlike anything offered by other learn to swim programs. The program is designed for children over 6 years all the way up to adults, and students progress through the levels at their own pace, mastering the skills in one level before advancing to the next. 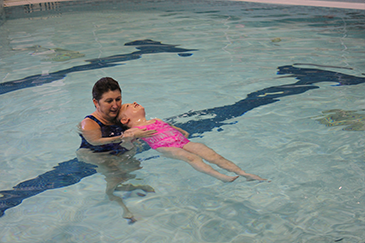 Each level of our Learn-to-Swim class includes training in basic water safety and helping others in an emergency, in addition to stroke development. Courses meet over 6 sessions of 45 minutes each. Participants will learn how to perform a hurdle approach and then learn straight, tuck, and pike dives as well as how to stretch properly. Children should be able to: dive from the side of the pool and swim 25 yards. Participants will build on skills learned in Level 1 and work toward inwards, flips and diving from the 3-meter springboard. Advanced participants will be introduced to twisters and platform spotting. Children should be able to: perform the straight, tuck and pike positions and perform front and back dives. We have designed our lessons to meet any recreational or competitive swimming and diving needs for both children and adults. With help from our trained instructors and flexible schedule, your lesson will be individualized and self-paced. We also offer lessons for children and adults with disabilities. 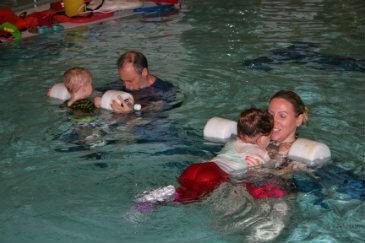 These lessons are led by Water Safety Instructors who are certified by the American Red Cross and have the expertise to meet the needs and goals of the participants. Please purchase your lessons at the Rec Pro Shop before your first scheduled lesson. Need to cancel a lesson? Contact 513-529-1844 at least 24 hours in advance. You will be charged if we are not notified.